I’ve hinted at this many times on the Flyertalk forum and previously in this post, as well as my BBM groups, so I’m assuming that if you read me you *should* have known about this already. All the major bloggers have blown this one, so I might as well talk about it as well. US Airways Dividend Miles haven’t been putting fuel surcharges on awards, in all classes of service, on any of British Airways’ flights (not just ex-Brazil, which doesn’t permit fuel surcharges to be added). 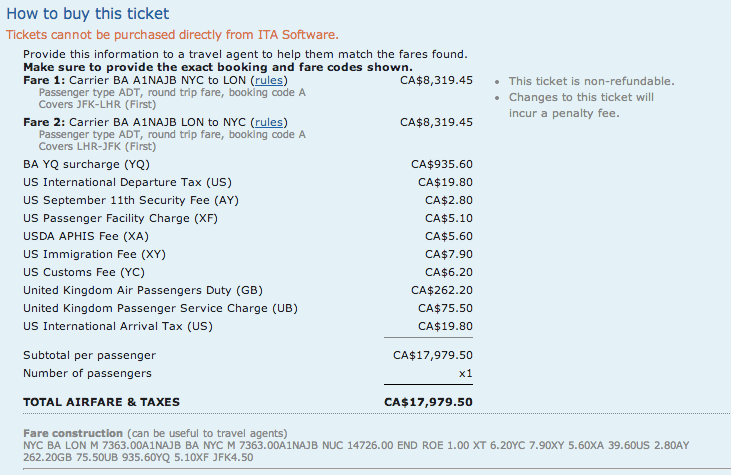 This is the only way you can fly from North America and get no fuel surcharges on British Airways. This has been going on ever since US Airways joined oneworld a month ago. It’s been a great glitch because even a roundtrip British Airways New York to London in First class has $935 in fuel surcharges. As long as you avoid flying out of London Heathrow and their Air Passenger Duty, your taxes should be quite low, and your redemption will not have fuel surcharges and only the airport taxes/fees. My redemption three weeks ago for Christmas had two British Airways first class segments and only around $250 dollars in taxes. The easiest way to look for British Airways space is actually on aa.com. 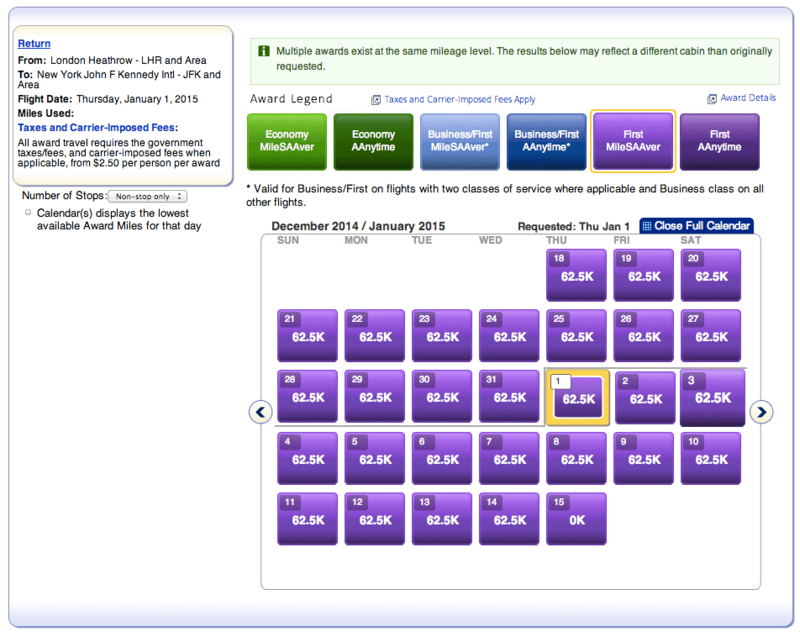 The easiest route in my opinion to find award space in first class is London – New York and v.v. You can see that a sample search right now pulls up at least on seat every single day even over the winter holidays. If you have wanted to fly British Airways in premium cabins without fuel surcharges, this is your chance. Get on this as soon as possible! how many US Airways Miles is it for to fly on BA metal Asia >USA? 120,000 from North Asia, 160,000 from South Asia. just wanted to let you know I read your USDM oneworld post back on April 6th and enjoyed how you gave the tip of no fuel surcharges at the end of the post. You didn’t spoon feed it to us yet you did give your readers a reward for reading the entire post! 😉 I myself will not be taking advantage of this though. Do you think reservations which are under the 72 hour hold are under threat in case of any surcharge changes? If usdm decides to add fuel surcharges while your ticket is still on a hold, ticketing it will incur YQ.